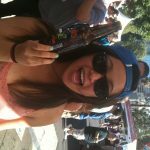 This is the lucky girl who finished the last drop of beer we served at the beer festival yesterday in downtown LA. We poured Pumpkin Head beer by Shipyard (which ran out first) and Smashed Blueberry (also by Shipyard). (Shhhh… I poured myself a couple of mugs on the side). That is true beauty… and the beer.